Since 1963, the college has been entrusted a responsibility to develop human resource which will educate and disseminate need based agricultural technologies to the farming community of the State. Nearly 6750 students have obtained B.Sc.(Agri.) degree. Many students are being actively engaged in public and private sectors of the State. The human resources are being utilized for agricultural education, research and extension needs of the State and Country. Education : This is the most important mandate of the College to impart agricultural educational training to UG and PG students to develop good skill and confidence to improve the sustainable productivity of various field crops. 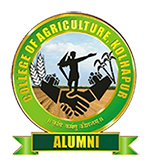 Since last 5 decade, the College has made tremendous progress in respect of improving the quality of agricultural education and development of students carrier. Since last decade 221 students successfully achieved the National level Jr. Research Fellowship. Most of the students of this college perform exceptionally well and stood first in University list. The students are being educated and trained for agricultural sciences. The allround personality development of students is being taken care of through NCC, NSS, Sports, cultural activities etc. The students are also exposed for 6 months at village level through Rural Agricultural Work Experience (RAWE) programme in their VII semester. Similarly, various modules of Experiential Learning are being implemented in VIII semester of B.Sc.(Agri.) and the students are exposed to acquire specific skill of agricultural sciences through visits and agro-industrial training. Regarding Extension activities in each Module, it included visit to the Press, Radio Station, Doordarshan unit and College Development Block. The students were enriched with Hands on Experience. Dr. A. L. Pharande, was conferred with Best Poster Presentation Award of Indian Society of Soil Science for the paper entitled ‘Post Biomethanated Spentwash for enhancing Crop Production and Soil Quality’ at 73rd Annual Convention of the society on 29th November,2010 at Bangalore. Er. Ajay B. Deshpande received “Baliraja: Dr. Rahudkar Best Book of the Year 2005 Award” in 2006 from Baliraja Magazine, Pune. Er. Ajay B. Deshpande received “Rotary Aadarsh Seva Award” for Vocational Education in 2006 from Rotary Club of Kolhapur Sunrise. Er. A. B. Deshpande, Assistant Professor of Agril. Engineering (IDE) , received Best Scientist / Technologist Award in BHIMA KRISHI-2010 Exhibition. Dr. Prakash A.Unde and Prof. Arun P. Patil. Received 1st Prize for technical paper presentation on “Storage on Dehydrated Tomato Products in the IEI Convention” held at MPKV, Rahuri in Feb. 2010.